When Kyle Jensen looks at the award-winning Hilmar Ingredients’ California Headquarters and Innovation Center, he sees solar panels that generate nearly 25 percent of the energy used at the facility and native landscaping irrigated with water recycled from incoming milk. 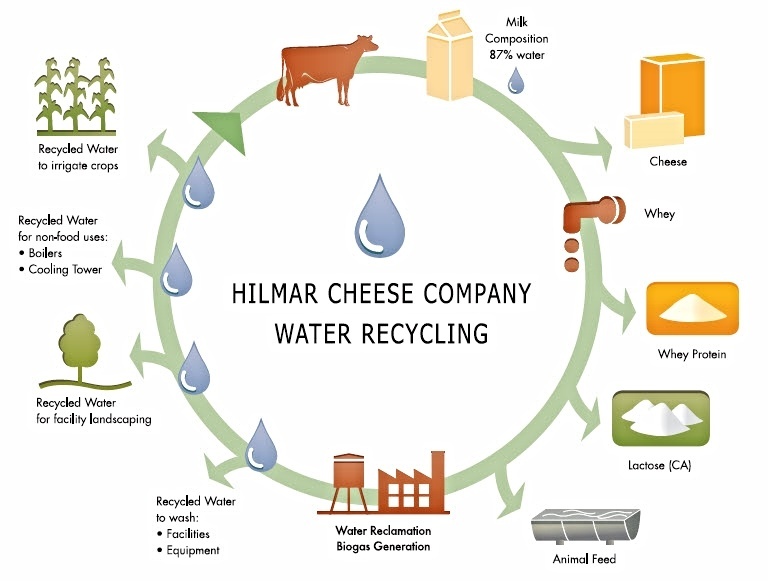 The graphic below is an example, illustrating how Hilmar Cheese Co., and its business unit, Hilmar Ingredients, practices water recycling. Jensen’s experience is ever more commonplace in today’s U.S. dairy industry. Even though they have a long history of responsible land, animal and resource stewardship, U.S. dairy farmers and processors are upping the ante with investments in systems and facility design to minimize water use, energy use, greenhouse gas (GHG) emissions and waste. In fact, the drive for dairy sustainability is an industry-wide movement spearheaded by the Innovation Center for U.S. Dairy. 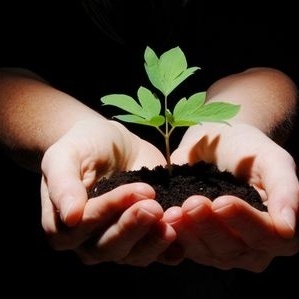 In addition to partnerships with the World Wildlife Fund and the U.S. Department of Agriculture, more than 110 organizations invest their time and expertise on the checkoff-funded Sustainability Council, which guides Innovation Center-led initiatives to support the U.S. Dairy Sustainability Commitment. As part of that commitment, the Innovation Center has completed GHG lifecycle assessments for fluid milk and other dairy products to serve as baselines for the industry to improve upon and helped establish the industry goal to reduce U.S. GHG emissions of fluid milk by 25 percent by 2020. The Innovation Center is also working through the Global Dairy Platform and the International Dairy Federation to ensure that there is a common global method to measure dairy’s global footprint. This is especially important to keep sustainability as a pre-competitive issue among suppliers and prevent consumers from overestimating dairy’s environmental impact. For companies serving export markets, the increased spotlight comes at a good time. Overseas customers are more closely examining their suppliers from the standpoint of sustainability, looking at the business from the farm all the way through distribution. Hilmar Cheese Co. and Hilmar Ingredients. Hilmar Cheese Co. earned recognition for its California cheese manufacturing plant at the fourth annual U.S. Sustainability Awards given out this spring by the Innovation Center for U.S. Dairy. The awards honor outstanding businesses for socially responsible, economically viable and environmentally sound practices that promote the health and well-being of consumers, communities, cows, employees, the planet and business. Last year, solar energy systems and biogas digesters reduced energy use by 5 percent and extensive water reduction and reclamation efforts reduced direct water usage by 17 percent. Programs at both the Hilmar, Calif., and Dalhart, Texas, plants reduced solid waste and recycled 190 tons of paper and cardboard, 7.6 tons of plastic and nearly 10,000 lbs. of e-waste. Hilmar documents its efforts in a downloadable (pdf) sustainability report. California Dairies, Inc. CDI maintains a comprehensive dairy sustainability program to reduce its carbon footprint, and minimize energy and water use. It operates a GHG and water reduction strategy across its network of six plants. Its Tipton, Calif., operation is a sustainability showcase. The Tipton cogeneration facility has reduced GHG emissions by roughly 22,000 tons per year since opening in 2005, the equivalent of taking 4,200 cars off the road. Tipton returns 44 percent more water than the plant utilizes each day to local groundwater aquifers, making CDI a net water generator, especially important in California today. CDI has a downloadable sustainability report it shares with global customers. Joseph Gallo Farms. This California-based cheesemaker is a water conservation expert. The company reclaims 100 percent of its cheese effluent and captures steam from pasteurizers and other machinery for use in other farm and factory applications. This practice—in addition to accepting as much as 10 million gallons of storm water and wastewater every day from local communities to use for irrigation—helps conserve at least 2.9 billion gallons of water per year. That is roughly equivalent to 11 million people taking a 10-minute shower each. The following video shows stewardship efforts at Joseph Gallo Farms in Atwater, Calif. The list of trailblazing dairy sustainability projects is far too long to do justice in a single article. It is an industry-wide, long-term commitment. In 2007, U.S. dairy farmers and companies made an industry-wide commitment to being global leaders in sustainability. The fifth annual U.S. Dairy Sustainability Report (released this week as a downloadable 39-page pdf document), describes in some detail how that goal is becoming a reality. The Innovation Center for U.S. Dairy report not only explores Innovation Center-led research programs and activities, but also lists specific actions being taken by more than 100 U.S. dairy farms, businesses and partnerships. An infographic summarizes the findings. The dairy industry was built on sustainability—farmers are the original stewards of their land and animals. It is simply part of typical life on a U.S. dairy farm. In the area of GHG emissions, U.S. dairy farmers already emit about 45 percent fewer GHG emissions per unit of milk produced compared to the global average, says Erba. “As the most efficient producer of GHG emissions in the world, North America and the U.S. dairy industry serve as a sustainable model for dairy farmers in developing countries,” says Erba. USDEC participates in the U.S. Sustainability Alliance, a consortium of U.S. agricultural, forestry and fishery organizations dedicated to raising the awareness about sustainable production practices in the United States to target audiences in Europe. “It took the industry a while to realize we needed to document and communicate the good things dairy farmers do ‘naturally,’” says Bargetzi. The U.S. Dairy Export Council is primarily supported by Dairy Management Inc. through the dairy farmer checkoff. USDEC fosters collaborative industry partnerships with processors, trading companies and others to enhance global demand for U.S. dairy products and ingredients.